Bariatric mattresses are specially designed for plus size and overweight sleepers to provide optimum comfort and treatment benefits. Bariatric mattresses come in widths from 36-inches to 60-inches to provide ample room, and accommodate weight capacities ranging above 500 lbs to 1,000 lbs. 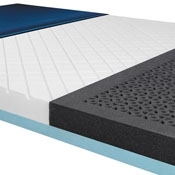 Like most medical mattresses, bariatric mattresses are available in a range of type options, from Deluxe High Density Foam to Alternating Pressure with Low Air Loss functionality. 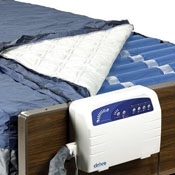 Protekt Aire 8000 Alternating Pressure Bariatric Mattress System, 42" x 80"
Protekt Aire 8000 Alternating Pressure Bariatric Mattress System, 48" x 80"
Med-Aire Plus Bariatric Alternating Pressure Mattress System, 42" x 80"
Med-Aire Plus Bariatric Alternating Pressure Mattress System, 48" x 80"
Protekt Aire 9900 True Low Air Loss Mattress System w/ Alternating Pressure & Pulsation, 36" x 80"
Protekt Aire 9900 True Low Air Loss Mattress System w/ Alternating Pressure & Pulsation, 42" x 80"
Protekt Aire 9900 True Low Air Loss Mattress System w/ Alternating Pressure & Pulsation, 48" x 80"
Med-Aire Plus Bariatric Alternating Pressure Mattress System, 54" x 80"
Protekt Aire 9900 True Low Air Loss Mattress System w/ Alternating Pressure & Pulsation, 54" x 80"